A website for Chinese newspaper Global Times recently published photos of a new Japanese military helicopter "design concept". Too bad it's not real. It's not even made by the Japanese military. 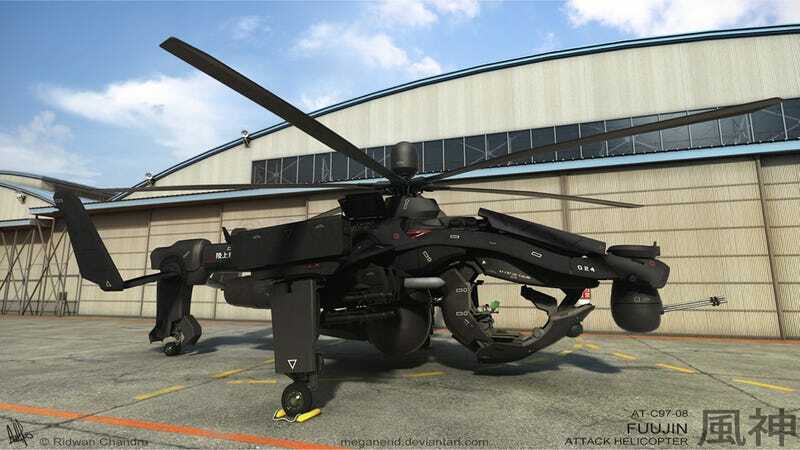 On Global Times' website Huanqiu.com, the text reads, "This appeared online today; it seems to be a concept for a Japanese Self Defense Force armed helicopter made by the Japanese military complex." The paper also added, "One can see that because this type of technology is not yet available, it looks like something out of science fiction." The photos were published online in the Global Times' "military" section. There was a gallery of "Fuujin Attack Helicopter" images, art site DeviantArt URL watermarks and all. The story even appeared on Chinese news source Xinhua, which is like the Reuters or AP of China. The Xinhua story, which cites Global Times, also said that the Japanese Self Defense helicopter concept was "designed by a Japanese professional." On Chinese social networking site Weibo, people are baffled at how this helicopter would even fly. "This design looks cool but there isn't anything special, does it even fly?" asked Weibo user hanyu_cger. "Without a tail rudder how does it maneuver?" Others thought it looks more like a comic book design than a military one. Some even claimed it was totally real, while others said it was a Japanese rip-off. Nobody really seemed to realize the DeviantArt URL (probably because it just looked like a string of English words). Online in Japan, people were baffled, too. On 2ch, some responded by saying things like, "What the hell is that?" Or, "I want a plastic model version of this!" The Global Times and Xinhua are real news sources in China. It's odd that they would use images with DeviantArt watermarks to scare up fear among readers about Japanese military and technological power. Maybe they didn't know. This is somewhat reminiscent of the time, however, when people online in Japan confused a Blizzard staffer's digital mecha creations with U.S. military hardware. This past April, Choa wrote on his DeviantArt page, "Still looking for work and resting, relaxing a bit, doing personal works and stuff." Maybe something good will come of this. If he hasn't yet found a job, maybe Choa will get work? Is the Japanese military hiring?